Nina Pham, the Texas nurse who suffered with Ebola and is now "Ebola Free", was released on Friday from National Institute of Health in Bethesda, Maryland. In her press conference, Pham said she felt "fortunate and blessed" and thanked her care team. She also stressed her desire to return to a normal life, and be reunited with her family which included her "dog family". It has been widely reported how close Nina is to her dog Bentley, a King Cavalier Charles spaniel . They have been separated since October 10th when they both were put into isolation. However, the reunion will have to wait until November 1st. A Dallas County Judge, has ruled that Bentley must remain in quarantine until the end of the recommended period, to make certain that the dog is virus-free. 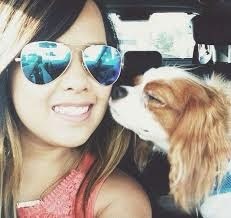 Dallas Animal Services has been caring for Bentley and has been giving daily feedback to the Pham's family. Bentley tested negative for Ebola last week and will have one more test before his 21-day quarantine ends on the first of November. Pham is now immune, but veterinarians are concerned, if she visits Bentley, it could effect his demeanor and make it harder for them to tell if he is demonstrating symptoms. Bentley has suffered from separation anxiety and they do not want to make it any more difficult for him.